Back in January I went to visit my friend T from uni who had just moved to an apartment on Sydney Rd. We were meant to go out for lunch to Albert St Food & Wine which had just started serving food that day. I tried to get there, but it was a disaster, I just stuck in 3 different sets of roadworks and it ended up taking 2 hours to get to T’s place. By the time we got to Albert St it was almost 4pm and their lunch service was over. 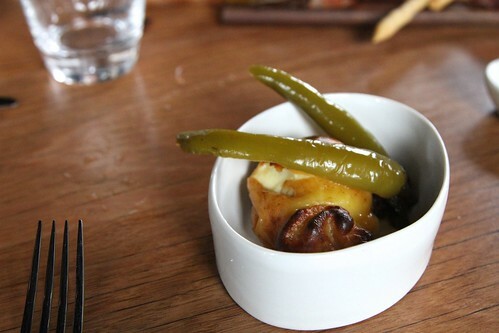 Luckily for me they were still serving starters so we shared a serve of the grilled haloumi with zucchini pickle ($12). And it was good. No, it was great. It was so great that it made all my frustration at spending 2 hours stuck in ridiculous traffic go away. So filled with the joy of grilled haloumi I was looking forward to getting back. Finally Gerard and I managed to get there for lunch to celebrate his mum’s birthday. The next week I went to write up my blog post when I noticed that somehow I’d managed to accidentally delete all the photos off the memory card. Nothing about Albert St was going right for me, well, other than the food obviously. This story does have a happy ending though, Gerard worked his magic, recovered the photos and now they’re here for your enjoyment. Back to the Albert St experience for a while. 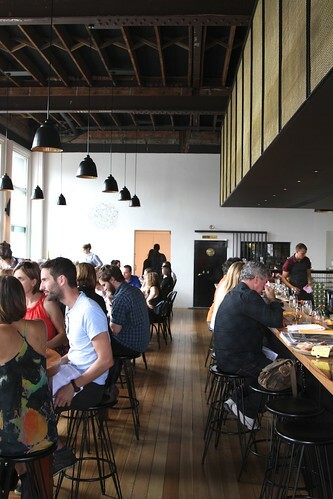 I love the fit-out, especially the exposed ceiling beams and the charcoal building exterior. 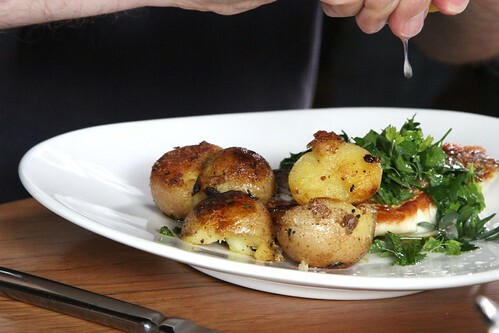 I’m not going to bore you with any more of my ramblings now though, lets get on to the important stuff, the food! Before you even take your first bite at Albert Street Food & Wine, you just can’t help but admire the detail of the fit-out. The imposingly polished exterior tempts you into the large open dining hall which is so pretty on the eyes you just want to take it home and do unspeakable things to it. Hanging cured meats, a large bar and a pantry shop to the side selling all manner of take home food goodies means you can still enjoy Albert Street when you leave. So, we’ve established that it’s good to look at, but what’s it like in your mouth? The entrees were first class; I’m still having dreams about the mozzarella ball. The scarcity of bread annoyed me a little, but I was honestly too distracted by the cheese at the time to notice. This unfortunately set the bar just a little too high, and my main course pizza dish was underwhelming. It’s not that it was a bad pizza by any stretch of the imagination, but I was expecting a little bit more attention to detail considering the calibre of the entrée dishes. It just felt to me like a pub pizza. 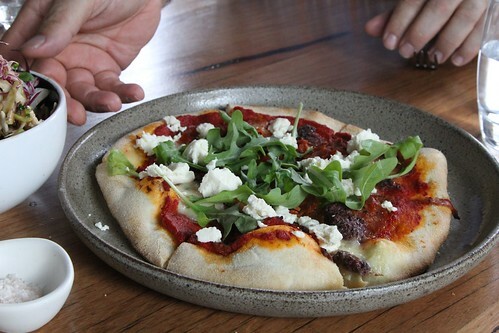 A good pub pizza, but nothing more than that. Luckily the arrival of the tiramisu reinterpretation for dessert put me back on cloud nine; it was beautifully presented and tasted even better. For me, Albert St Food and Wine was a bit of a roller-coaster. The food at times was enchanting and at other times almost plain. Same with the service; the wait staff were very attentive, but the food was leisurely in its arrival. To be honest, I think I’m just trying to be pedantic. 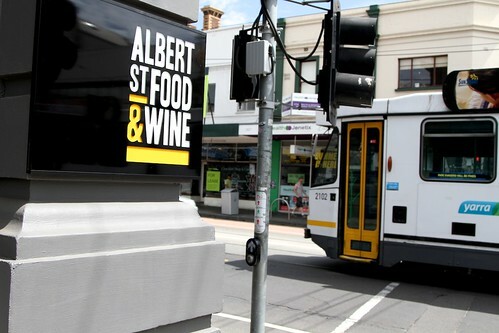 You’ll enjoy Albert St Food and Wine, for the food and for the décor. 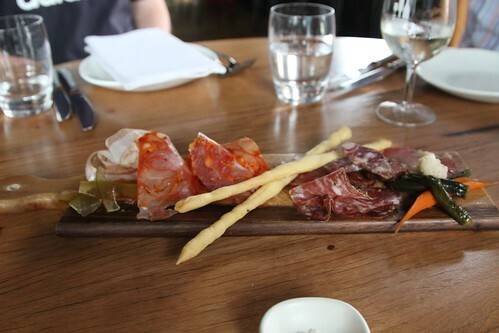 We started with a small charcuterie selection to share ($24). A selection of cured meats, cut into deliciously wafter thin slices. We also shared a couple of the special smoked mozzarella with peppers and olive tapenade (around $10). The mozzarella was amazing. It was probably the highlight of the whole meal for me. I know I’m a cheese addict, but it was genuinely tasty. It was almost good enough that I didn’t miss the haloumi. Almost. 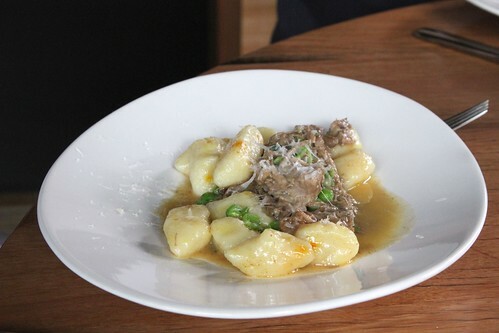 For mains, I had the saffron gnocchi with braised veal, crushed peas and sage ($28). While the gnocchi was a little on the soft/possibly not cooked quite enough side for me (I assume that’s a poor taste on my part thing), the veal was great. It was juicy and meaty but not too heavy and worked very well with the peas. 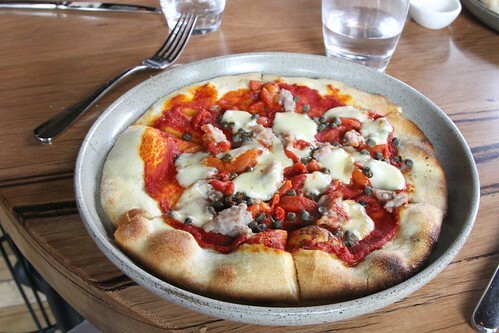 Gerard had the Albert St special pizza with roasted peppers, pork & fennel sausage and smoked mozzarella ($18). Gerard thought the pizza was fine but wasn’t blown away by it. I liked that there was more smoked mozzarella. 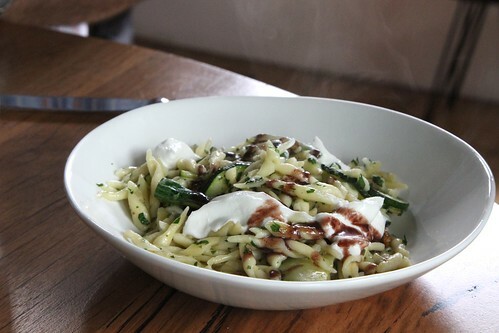 Gerard’s mum tried the trofie pasta with zucchini flowers, goats cheese and black olive oil ($22). Gerard’s dad had the pizza special of the day which I’m pretty sure involved olive tapenade, goat’s cheese and some sort of cured meat. Our 5th had a fish special. To be honest I can’t remember what it was or how much it cost. I took a note but I deleted after we lost our photos. Who knew we’d be able to recover the photos but not the note? It looked good anyway. 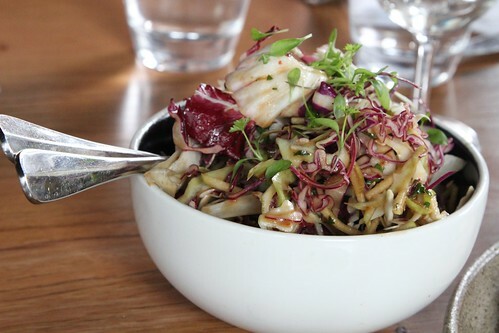 We also had the red cabbage, radicchio & apple slaw ($9). Because it was a birthday we all went a little too far and decided to order dessert as well. 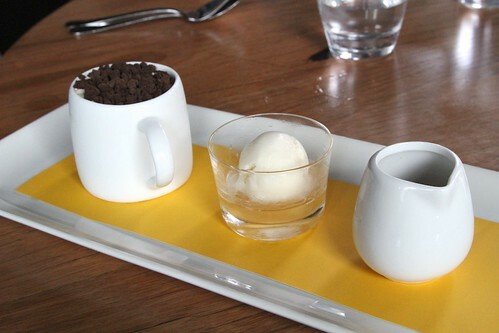 Gerard and I shared the tiramisu served with ice cream and coffee ($18). Personally I found it waaaay too rich, it actually left me feeling quite sick. Gerard on the other hand really enjoyed it. I guess he’s just more of a man than I am when it comes to coffee/liquor flavoured desserts. And you know, in general. 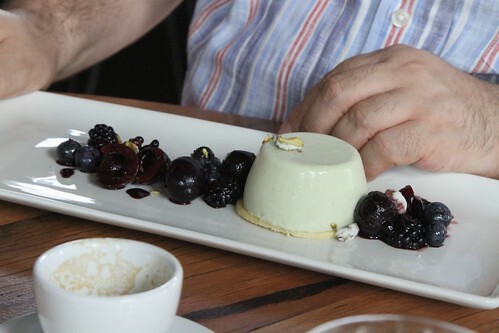 Gerard’s dad had the pistachio panna cotta with berries ($16). 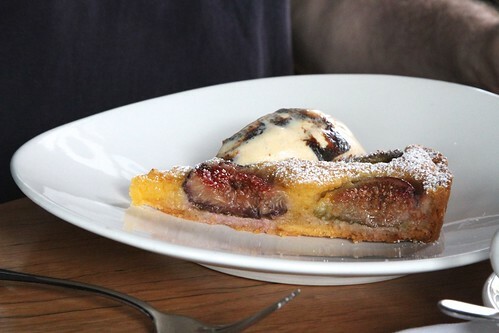 Gerard’s mum had a special, a fig (and semolina?) tart. This entry was posted in Eating out. Bookmark the permalink. Trackbacks are closed, but you can post a comment.